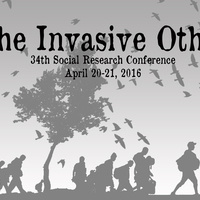 The Center for Public Scholarship at The New School is pleased to present the 34th Social Research conference, "The Invasive Other," on Wednesday, April 20, and Thursday April 21, at The New School in New York City. This conference is grounded in the premise that while seemingly of different orders, invasive others — whether people, plants, ideas, or pathogens — are described in similar ways and are patrolled and controlled through similar technologies, logics, and policies. The conference explores the way the language and technologies intersect and play off one another. By placing these different “invasives” alongside one another, we will learn more about the nature of Otherness in our world and how it is managed, governed, or eliminated. If we are to protect the rights of others, this knowledge is invaluable. Co-organized by Arien Mack, Director of the Center for Public Scholarship at The New School, and Miriam Ticktin, Co-Director of Zolberg Institute for Migration and Mobility at The New School. This conference has been made possible by a generous grant from the Carnegie Corporation of New York. Sponsored by the Center for Public Scholarship and the Zolberg Institute for Migration and Mobility at The New School.